Recently banished, unfairly, by the school’s popular crowd, former “it girl,” Miranda Prospero, finds herself in a brave new world: holding dominion amongst a rag-tag crew of geeks and misfits where she works at the Hot-Dog Kabob in the food court of her local mall. When the worst winter storm of the season causes mall workers and last-minute shoppers to be snowed-in for the night, Miranda seizes the opportunity to get revenge against the catty clique behind her social exile. With help from her delightfully dweeby coworker, Ariel, and a sullen loner named Caleb who works at the mall’s nearby gaming and magic shop, Miranda uses charm and trickery to set things to right during this spirited take on Shakespeare’s The Tempest. If you couldn't tell by now I'm a huge YA fan when it comes to books. There's just something about the stories that just make me think about my teenage years. 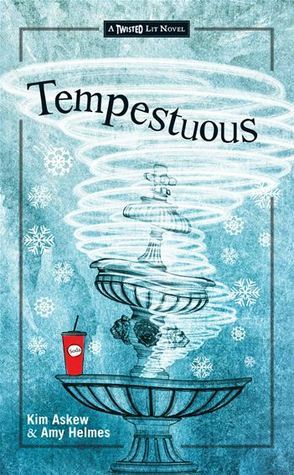 I got to read, Temmpestuous over the Holidays and I have to say I really enjoyed it. When I first started reading I have to admit it took me a bit to get into it. I guess that happens with most books. After the first chapter I couldn't put the book down. I thought it was a great start to the first book of the Twisted series. Huge Shakespeare fan over here. I absolutely loved the chemistry between Miranda and Caleb. It's not every day you are literally handcuffed to someone and the relationship between them is a mix of being hilarious, uncomfortable and romantic all at the same time. I kept finding myself laughing out loud with some of Miranda's witty comments and that's when you know you're reading a great story. Another thing I loved about this book was the setting, at the local mall. This definitely brought back memories of working at the mall when I was a teenager and the similarities of being stuck in an awkward position with ex friends and ex boyfriends. I could picture all the drama as it was unfolding. This is definitely a book that's worth reading. It's full of drama, romance and humor, which are all three things I love about YA stories. Both Kim and Amy did a fantastic job on this, I'm looking forward to reading the second installment, Exposure! Disclosure: All opinions are my own. I received Tempestuous at no cost for the purpose of this review. No other compensation was received. Big thanks to the PR company for the giveaway prize!